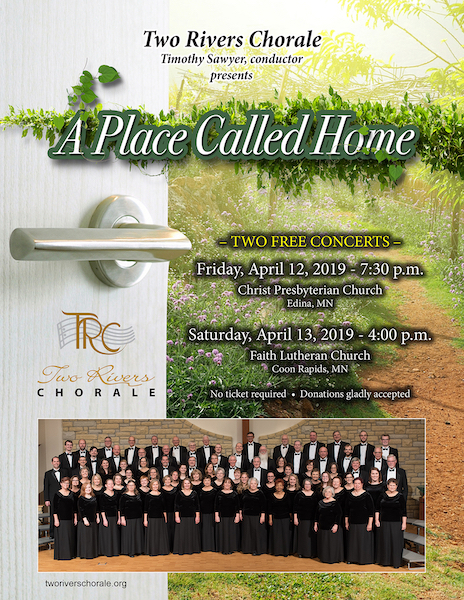 Two Rivers Chorale – We come together to delight in the beauty and power of choral singing. Together we create fulfilling musical experiences for ourselves and for a growing and appreciative audience. We come together to delight in the beauty and power of choral singing. Together we create fulfilling musical experiences for ourselves and for a growing and appreciative audience. A reprise of our program from the historic “Blizzard of April 2018,” this concert is a richly layered celebration of people working, singing together and sharing the gift of music in our diverse communities and lives. Belonging, finding a “home” and a safe place will be described in multiple ways through music and the spoken word.